Includes 4 UPC tips (LC, SC, 1.25 mm and 2.50 mm). APC, Bulkhead tips available. Dirty fiber optic endfaces are the major cause of problems in singlemode and multimode fiber optic systems. 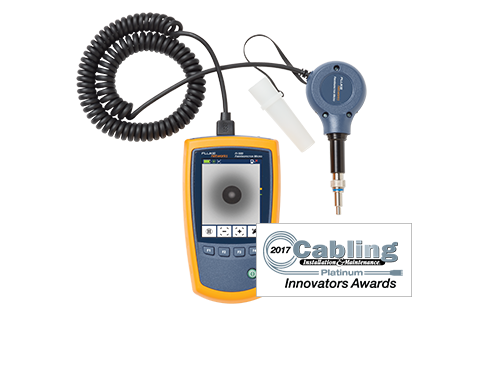 The FI-500 FiberInspector™ Micro fiber inspection scope camera removes the hassle associated with inspecting fiber end faces, especially in low light and high cable density situations. It is very simple to use: Simply plug the cable into the FI-500 and touch the AF button. Within seconds, the fiber endface comes into sharp, clear view. And if you're working in a difficult to reach place or you can't get the image to stand still, just touch the pause button to freeze the image. The FI-500 is designed to simplify the inspection process. The built-in PortBright flashlight helps you find the right port or cable. The small-profile probe fits into tight spots, and features pushbutton controls for simple operation. Autofocus camera provides a sharp view of the endface in a few seconds, while the pause button freezes the image on the crisp 320 x 240 display for more detailed inspection. The FI-500 FiberInspector Micro fills the gap between a manual scope and a fully automated inspection scope. The FI-500 has the simplicity and practicality of a manual inspection scope, but with advanced features to reduce troubleshooting and inspection time. Manual fiber inspection scopes are simple to use, but they don't work well on patch panels or situations where there is a high density of fiber. Holding it up to one eye and closing your other eye is often inconvenient or impractical, especially in a dark room. Fully automatic inspection scopes analyze and grade the cleanliness of fiber connections which is important for many applications, but analysis is usually not needed for quick basic troubleshooting. Fiber panels are often densely packed with fibers small LC connectors. It can be difficult to see the port of interest without having extra lighting. You can use a separate flashlight, but then you need to hold more items or have a helper hold the flashlight. PortBright is a flashlight that is built into the probe and allows you find the port and then connect the probe tip. PortBright is activated by a button on the probe itself. The probe is only 23mm (0.95") wide and 51mm (2") thick which makes it easier to get into tight patch panels with less disruption of nearby fibers. All manual scopes and many digital probes have manual focus rings. This may require two hands and is sometimes difficult to focus in densely packed patch panels. 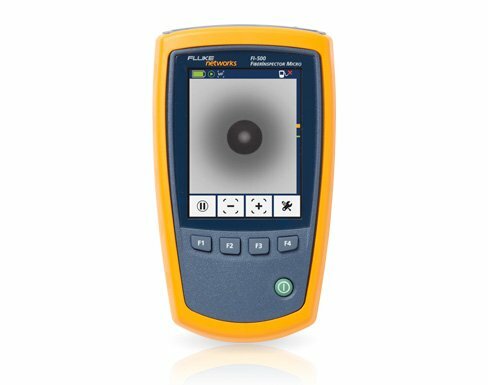 FI-500 can auto focus with the push of a button on the probe or on the display unit. Autofocus takes only 3-5 seconds and works great on UPC end faces. Autofocus works on APC (angled physical contact) also, however, if the APC tip is not aligned with connector, the connector or probe may require rotation and repeating auto-focus or manual focus. The autocenter feature activates as soon as you pause the image. The FI-500 will orient the fiber ferule directly in the center of the screen as well as initiate autofocus. This allows the user to inspect the fiber core easily without having to manually manipulate the fiber. FI-525 Fiber Cleaning and Inspection Kit Includes FI-500; complete cleaning supplies (cleaning cube, ten cleaning cards, solvent pen, 2.5 mm port cleaning swabs and 1.25 mm port cleaning swabs) and soft carrying case. 14 tips are available to address almost any port or connector configuration. 4 UPC tips are included (SC, LC, 1.25 mm and 2.50 mm). Each of these can be ordered separately if you lose one and there are also ST and FC tips. FI-500-TP-APC is a kit of four APC (angled physical contact) tips in a convenient case - SC, LC, 1.25 mm and 2.50 mm. An FC APC tip is also available. 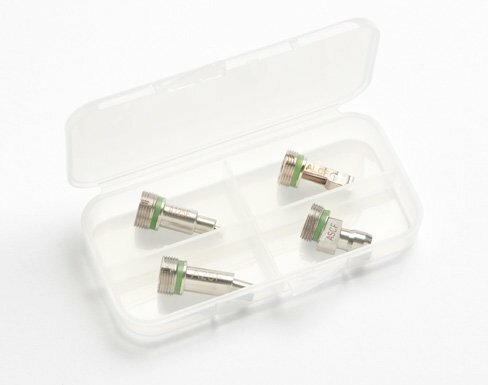 There is also a 46 mm UPC LC bulk head extender tip. 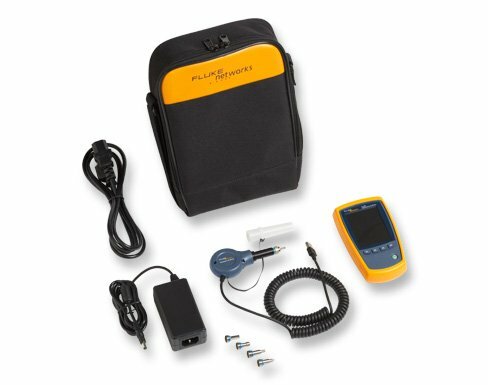 FI-500 FiberInspector Micro and wet and dry cleaning supplies to remove contamination discovered during fiber inspection with the FI-500. Kit includes: FI-500, NFC-KIT-BOX, and 1.25 mm swabs. *Tested using Gold Peak GH230AAHC batteries. Open Source Software documentation. NOT REQUIRED for using the FI-500. Gold Support for your FI-500 allows you to make the most of your purchase while ensuring a higher return on your investment. You will minimize your downtime, receive faster trouble resolution and have total access to all support resources. What do you get with Gold Support for your FI-500? Annual Calibration and Factory Refresh for the Power Meter and Light Source in the FTK1375 and FTK1475 - ISO 9001 standards compliance requires the unit be calibrated per manufacturer’s recommendations, which is annually. Keeping your equipment calibrated is critical to ensure accuracy when testing fiber networks. Our calibration processes are ISO-9001 controlled and designed to certify that your products meet all published specifications. To receive a loaner unit during calibration (available in most regions), we recommend you schedule your appointment 6 weeks in advance of your required calibration date. If a loaner is not required or calibration cannot be scheduled in advance, Gold customers may opt to instead receive a shipping waybill and calibrations will receive priority turnaround. Typical turnaround time for a calibration is 5 working days. Your equipment will be precisely calibrated to factory specifications (calibration certificate provided - calibration traceable with data available for extra charge), repaired as necessary with genuine OEM repair parts, upgraded with all of the latest software and firmware then cleaned and performance verified. In addition, all accessories that came with your kit will be tested and replaced if faulty or defective. Repairs and loaner equipment - If your unit should fail, we'll deliver a loaner unit via next business day delivery to keep you up and running. 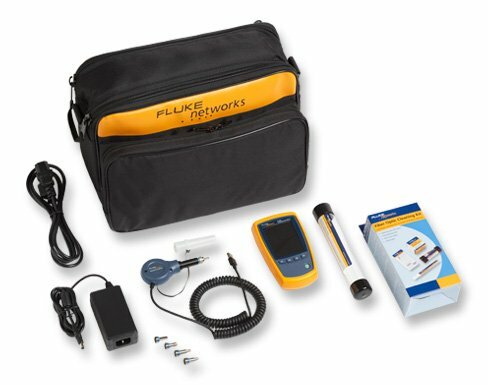 We'll repair your unit and replace defective accessories that came with your unit at no charge, with ""first on bench"" priority, and return it to you - all shipping paid by Fluke Networks." Accessory Replacement - Some accessories are essential to testing. If any accessory that comes with your FI-500 or Kit are qualified as defective or faulty by our technical assistance center, it will be replaced free of charge. Access to live 24 x 7 technical support - Extend the expertise of your staff. Gold Support includes priority access to our world-class Technical Assistance Center (TAC). Our centers in Seattle, WA and Eindhoven, NL employ a full staff of highly trained technical experts that are on call, including weekends and through the night, to answer complex troubleshooting questions, including GOLD only services such as: Test set-up and instrument configuration, Fiber testing and reference setting, Test results interpretation, including trace results analysis. Let us help you get the most out of your equipment and understand the results you are seeing. Ensure that you are getting the most out of your equipment with Gold Support Services.